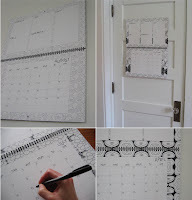 Every month features a repeating design drawn by the artist. (I'd be tempted to take the calendar down and color on it, myself.) Click the picture to the left for a more detailed look at some of the pages. From Daisy Janie.